I am just going to talk a little about lotus seeds and refer to my Eight Treasure Duck posted recently. I love lotus. Lotus flowers. The fragrance of my Lotus show gel. Lotus roots in soups. So you would think I would adore lotus seeds. But growing up I was rather diffident towards them. Sure, I liked them in my cheng teng, a clear, sweet and icy Chinese dessert, but other than that I was not a terribly huge fan. They have a powdery texture that I just did not particularly enjoy and their musky taste was a little strange to me. However, they grew on me. And now I quite like them. Especially when they have so many benefits to health. In Chinese medicine, lotus seeds are neutral in element. They are apparently good for the heart, spleen and kidneys. These tiny little nuggets of goodness nourish the heart and prevent insomnia. They supposedly tone up the spleen and kidneys - when I read this I had visions of my spleen and kidneys looking like Richard Simmons, prancing around with bar bells and doing jumping jacks. Thus, lotus seeds can alleviate diarrhoea caused by a spleen deficiency as well as cure urinary disorders and vaginal bleeding. Lotus seeds calm the nerves and I think that is quite fitting for a plant that is so prized among Buddhists as offerings to Buddha. I love passing by the temples and seeing the beautiful blooms of lotus flowers in the pails that devotees buy as offerings. However, if you have abdominal flatulence (I wonder where else it would come from ... or maybe I shouldn't ask ...), poor appetite or constipation, only eat lotus seeds in moderation. The Chinese love buns and one favourite is the lotus seed paste bun. Sweet and amber-hued, the lotus seed paste filling is wonderfully enhanced by the fluffy, steamed buns. I love lotus seed paste in the Chinese mooncakes which you only get in August during the Mooncake and Lantern Festivals. With a golden globe of duck egg yoke, the lotus seed paste mooncakes are to die for. I think the lotus is an amazing plant. Almost every part of the lotus can be used in Chinese cooking, from the flower to the seeds. The lotus seed is also considered as an auspicious item as it supposedly evokes good fortune. During the Chinese New Year, candied lotus seeds are given as gifts or tokens to visitors. That is why you will usually see lotus seeds offered in celebratory Chinese banquets as a dessert, in a rich soup, or in dishes like my Eight Treasure Duck. 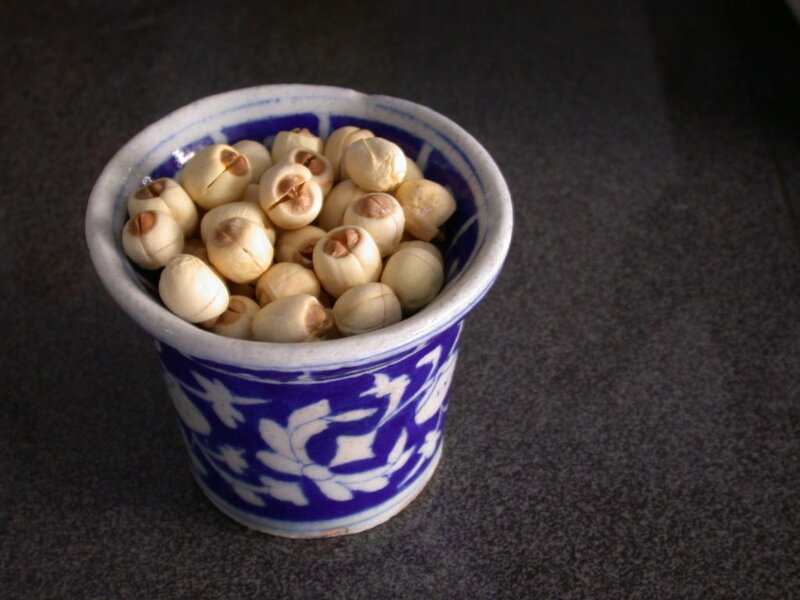 One note about the lotus seed is that they have little "hearts". These are the tender, new shoots that begin right in the centre of the seeds. You have to remove these are they are quite bitter. Also, if I remember correctly, my grandfather told me that they can be poisonous so always remove these. For fresh lotus seeds, you simply split the two halves apart and tear out the green shoots. If they are dried, just soak them till they are soft before you split them in half to remove the shoots. you can actually keep the whole if you just split them at the tip and pull out the shoots with your fingernails. For more information about herbs and such, visit Kalyn's Kitchen for her weekly Weekend Herb Blogging. This was fascinating to me. I love learning about these new foods. I have been to China, but I haven't ever tasted this that I know of. Hmm... I wonder if I could find it in any of the Chinese markets here. Surprisingly, they do have a good assortment of stuff, when I can find time to make a trip there. I'm glad you found it useful. I am sure your local Chinese markets will have lotus seeds. If not, do let me know as they are quite inexpensive and common here. I can send you a packet - we can have our very own Around the World in Herbal Daze Blog! LOL. Hi Lynn, thanks so much for visiting and your compliment! I'm not sure about embryo as the lotus is a plant and thus, does not have an embryo. Essentially, the lotus seed is made up of two halves, which you can see quite clearly in the picture I posted in my Mutton Curry post prior to this. In the centre, between the two halves, is where the shoots for a new lotus plant germinates. The new shoots are extremely bitter and cannot be eaten. I am not 100% sure as all this is from a child's memory but I remember my grandfather telling me that these new shoots can cause a bad stomache upset if not removed and consumed. The rest of the seed and in fact, almost the entire plant, is edible and have beneficial properties. I also vaguely remember my grandfather telling me a story that the lotus plant is precious to Buddha. So he protected the plant from rampant harvesting by making the lotus shoots inside the seeds poisonous. Only the devout and dedicated would know to remove these shoots and are therefore worthy to eat the lotus seeds and reap the benefits of this tiny treasures. Again, my grandfather was a grand storyteller and you were never quite sure if he made them up or if they were real. Hope that helps though. To me they have a taste like filberts (hazelnuts) -- or if you remove the little green shoot they taste VERY mild (like the mildest macadamia nut). So I guess I like the flavor of the shoot because it adds an interesting note.